The past couple days I've been a bit challenged to trade pullbacks. Some days, my rhythm of the market is excellent. I get in after a pullback as it's confirming that direction, but the past 2 days, I've gotten in after the big movement and right before it pulls back. Then, I have to wait for a retracement, as I patiently wait (sometimes holding my breath) for it to retrace. However, a retracement could be a reversal, so there is a point at which I set my cost stop just in case it's a reversal. In all my trades today, they were all retracements. The time periods I used today were 3 min., using the 15-min. to see the big picture. Did not go to the 1-min. today at all. 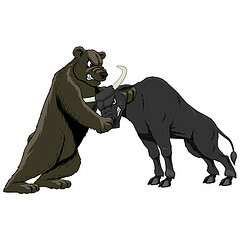 After EVERY bigger move, there is a pullback or hesitation before it continues back down. The best time to get in is after it's pulled back and started resuming back down. Perhaps in a future time, I will do a video of this, but right now, this is just a quick post. The question then is: How far will it retrace or pullback? The past 2 days, I used pivot points from looking to the left of where I am for areas of congestion or where resistance/support was, and/or moving averages. 1. When price action is moving sharply, the price action will be a bit far away from the 10 EMA. As it starts to get closer to the 10 EMA, you want to get out to take profits. When it pulls back to the 10 EMA, you can get back in again, but be cautious as it sometimes can also do a headfake and use the 20 EMA as resistance. This is assuming a downtrend. 2. As the 10/20 EMAs get closer, and possibly merging with the 50 EMA, this will often look like we've reach a support, so then look for a bounce to tag the 200 EMA. As I write this, I'm looking at the ES on a 3-min. scale, but this can hold true for other time periods. 3. Though I did not use fibs in trading the past few days, often a retracement will be in the 38.2%, 50%, or 61.8%. I've noticed in shorter retracements, it likes 38.2%. What I mean by shorter is a handful of candles. If you look at a bigger timeframe (it's relative) in that same period, meaning like 20-30 candles, often it will go to 38.2-50%. This needs to be cooberated with volume. Sometimes strong volumes in one direction will do one of 2 things - equally or greater moves in the opposite direction or a dissipation of volume. For strong moves in one direction and then equally in the opposite, what the market is doing is to shake out the remaining sellers (for a downtrend), before taking it to the next direction. They are ready to buy, but want to finish things off. What this is termed is "capitulation selloff". This really could also work the other way around. I sort of see this term as "pump & dump" (for an uptrend). You get a buying frenzy going on and before people can catch on, you've dumped a bunch of whatever it is. Once they catch on and have lost a lot, they finally begin selling, but by that time, the big boys are buying again as you're selling. Nice how the market works, eh?